The Sacrifice of Abraham is an oil painting created by Rembrandt in 1634. It is based on a story from the Bible. According to the biblical story, God asks Abraham to offer his sun Isaac as a sacrifice on the Mount Mariah. After Abraham bound Isaac to an altar and is about to slay Isaac by his knife, the angel of God appears and stops Abraham at the last minute. He tells Abraham that “now I know you fear God” and he has already fully obeyed the God. Therefore, Abraham finally sacrifices a ram nearby instead of Isaac. The Rembrandt painting depicts the moment of the angel preventing the sacrifice of Isaac. In majority sayings, God is testing Abraham to see whether he would kill his own son as a way to teat his loyalty. Isaac is the only son of Abraham and Sarah, who was promised to be given go the couple by God. But not until Abraham and Sarah got to their old age did Isaac was born. Abraham loves his son a lot, but he also believe in God’s word. He is a loyalty follower of God, and deeply believes that God will resurrect his son. In the baroque painting, Rembrandt portrayed Abraham as an old man with white beards, grey hairs and deeply wrinkled faces. 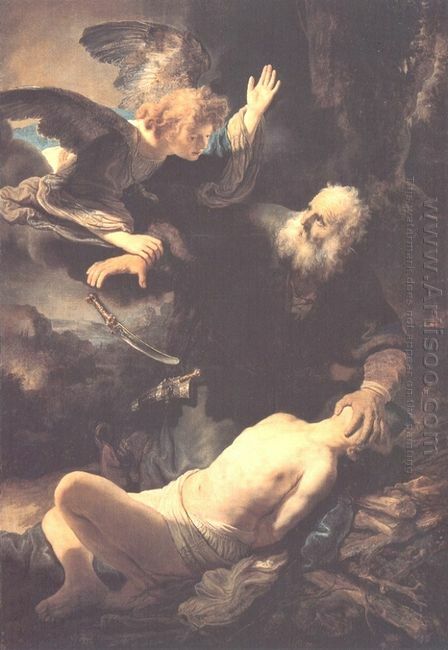 He is pushing back Isaac’s face by one hand, and the other hand is seized by the angel so that the knife was dropped to the ground. The light come with the angel shines on the naked body of Isaac, and Abraham’s face and hands. Other part of his body is shadowed in the dark, almost melt into the background, showing a typical and skilled treatment of light and shadow by Rembrandt.